My biggest passion is to radiate and transmit to others a sense of being totally alive, full of life. As an internationally experienced practitioner and teacher I take people to a journey of healing and self-discovery, to a journey of spiritual awakening and active joyful life. 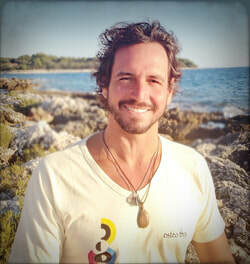 In our activities we integrate adventure, yoga, joy, massage, energy and different aspects of physical, emotional, mental and spiritual bodies. I am happy to meet you and share what I know for the benefit of us all. Whether you speak English or Spanish or simply the language of the Heart I am sure we will easily communicate our inner treasure. My teacher Iyengar has brought to the west a special way to experience true Yoga as given to us by sage Patanjali. Thai massage meets Osteopathy in bridge between East and West, combining Thai massage techniques with the precise and gentle touch of osteopathy. 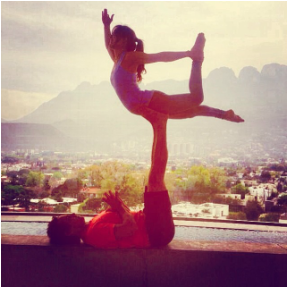 A beautiful merging of yoga, partner yoga and the art of acrobatics to experience flying and healing.